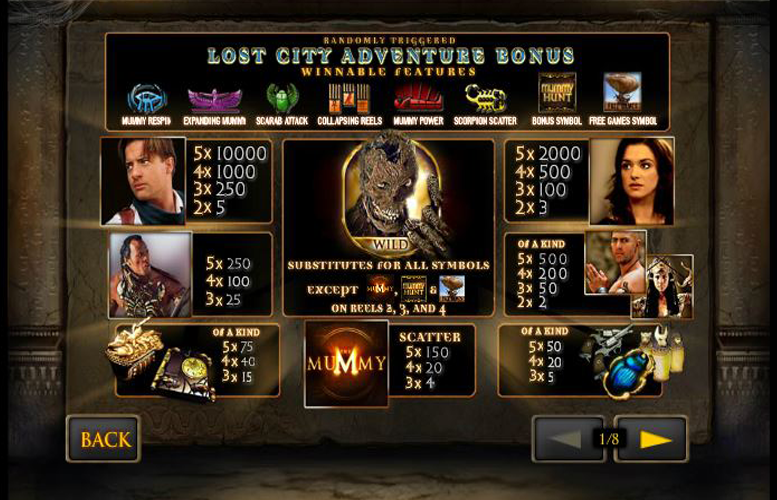 Based on the movie franchise of the same name, The Mummy slot from Playtech stays true to its source material, whilst incorporating a whole host of special bonus features. The look and feel of the title suits the movie well, and with so many side games it’s not one that grows old quickly. That said, the game’s low maximum bet, and potentially overcrowded gameplay features might put some players off from exploring this one too thoroughly. Great look and feel. Remains true to the original franchise and the dark imagery and mysterious music set a good tone for an action-packed title. Absolutely rammed with features. There’s a huge number of different ways to vary the gameplay experience. All the different main game features that can be collected, as well as three different bonus side games makes this one a must for those who get bored simply staring at the reels. In no way caters for high rollers, or even “medium rollers” for that matter. With a maximum bet of just £25, many who want to bet a little larger will be put off. A little confusing for some. Players who prefer a stripped back gameplay experience will likely find The Mummy a bit over-the-top with its additional features. There’s so many that the title probably isn’t ideal for those just wanting a few quick spins to blow off some steam. Rick O’Connell = 10,000x the line bet. Evelyn Carnahan = 2,000x the line bet. Imhotep, or Anck Su Namun = 500x the line bet. Mathayus = 250x the line bet. Golden beetle or book = 75x the line bet. Guns, scarab, or canopic jars = 50x the line bet. Without a doubt, the best thing about The Mummy slot machine is its extensive array of bonus features. There’s a lot to describe and each adds immense replay value to the title. This bonus feature is triggered randomly during the main game. Players are whisked away to the Lost City of Hamunaptra. There, they must pick boxes for instant cash and additional game features. If they uncover “collect” at any point, the bonus ends. However, players who have not yet unlocked all eight features, the “collect” box will also open the Book of the Dead. This prompts a new game feature to be revealed and awarded. 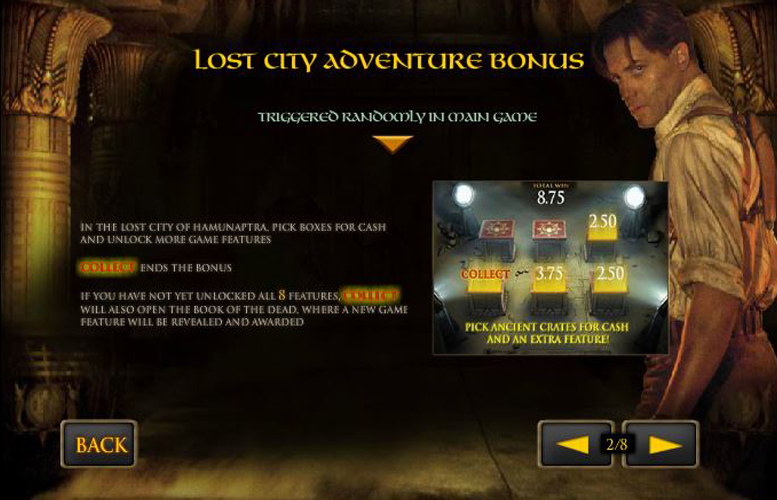 During The Lost City Adventure Bonus, players collect different features that are used during the main game. There is a total of eight to collect: Scorpion Scatter, Expanding Mummy, Scarab Attack, Collapsing Reels, Mummy Power, Mummy Respin. Only one of the features awarded may be active during the main game at a time. 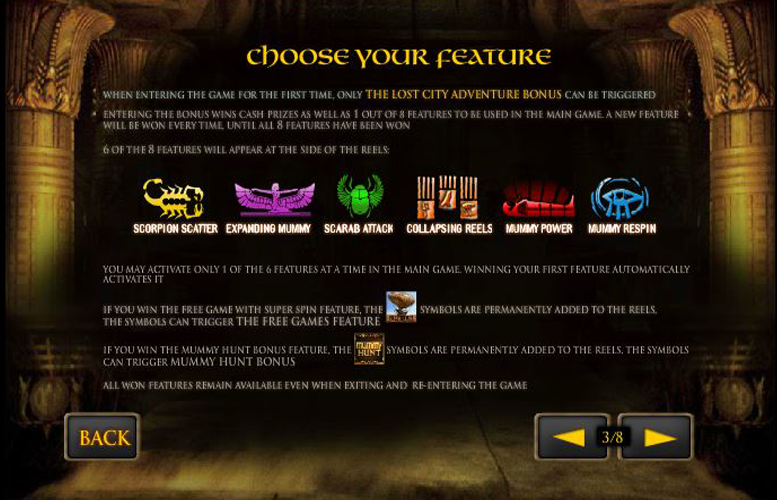 In addition to these, there are also a “super spin feature” in which additional “free games” symbols are added to the reels, and the Mummy Hunt Bonus feature. As with the “super spin”, additional “Mummy Hunt” symbols are permanently added to the reels. These can trigger the Mummy Hunt bonus. One of the best things about this bonus is that all symbols that are won remain available even when exiting and re-entering the game. Scorpion Scatter = The Scorpion “scatter” symbol pays scatter-like with a special pay table. Expanding Mummy = The corpse of the Mummy becomes an expanding wild. Scarab Attack = The corpse of the Mummy “wild” symbol landing anywhere on reel three distributes two additional wilds randomly, one on reel two and one on reel four. Collapsing reels = Any symbol that participates in a win “explodes”. This leaves a space which the symbols above fall to fill. When the reels have collapsed, the player is entitled to any new win that may result from the new symbol positions. These winning symbols explode too and the process repeats until there are no new winning combinations. Mummy Power = If Mummy “wild” symbols participate in winning combinations they multiply the win. If one, two, or three wilds made up the winning combination, then a multiplier of three, six, or nine is applied to the win respectively. 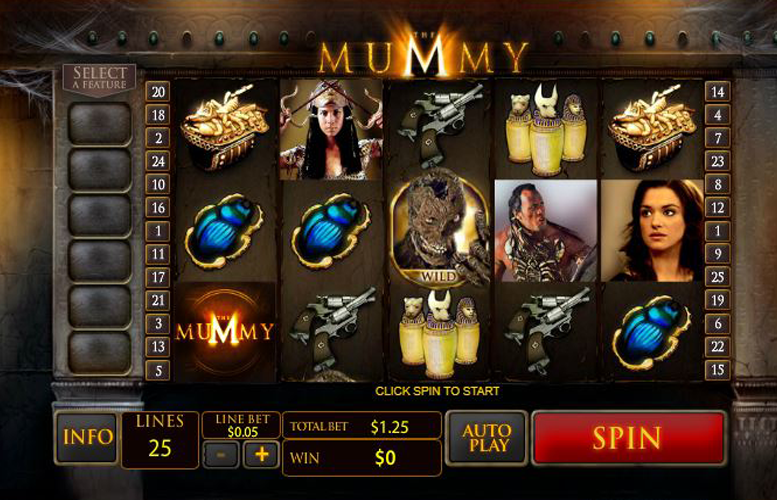 Mummy Respin = Landing a Mummy “wild” symbol anywhere on the reels freezes that reel for free respins until there is a win of any kind. Once activated, the Free Games symbols are added permanently to the reels. Landing them anywhere on reels one, three, and five simultaneously wins five free games and one super spin. During the first five free games, any “wild” symbols that appear on the reels are collected at the side of the reels. Before the super spin, all collected “wilds” are redistributed randomly across reels two, three and four. 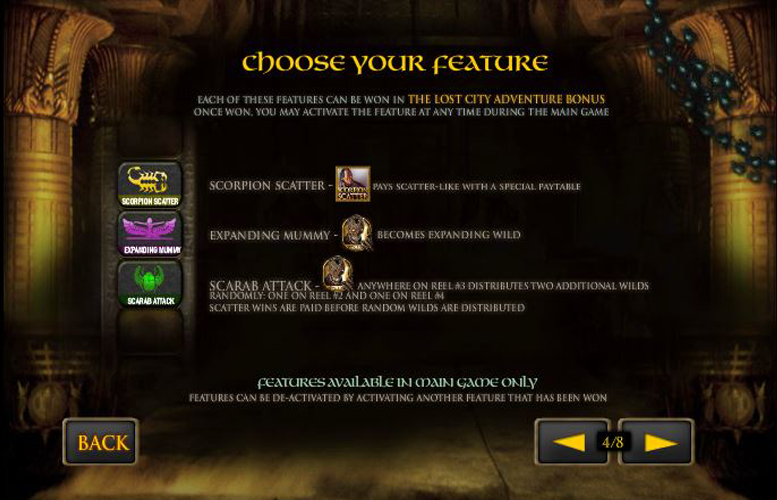 The Mummy Hunt bonus symbols are added permanently to the reels if won in The Lost City Adventure Bonus. Landing them anywhere on reels one and five at the same time triggers the Mummy Hunt Bonus. Players must hunt down Mummies for cash in the depths of a pyramid. While hunting, they’ll come to a point where they must choose to go right or left. The choice made will either lead to a mummy or a dead end. If you meet a Mummy, you will kill it for a cash prize and continue down the tunnel to another cross road. If you come to a dead end, the bonus ends after being ambushed by Mummies. 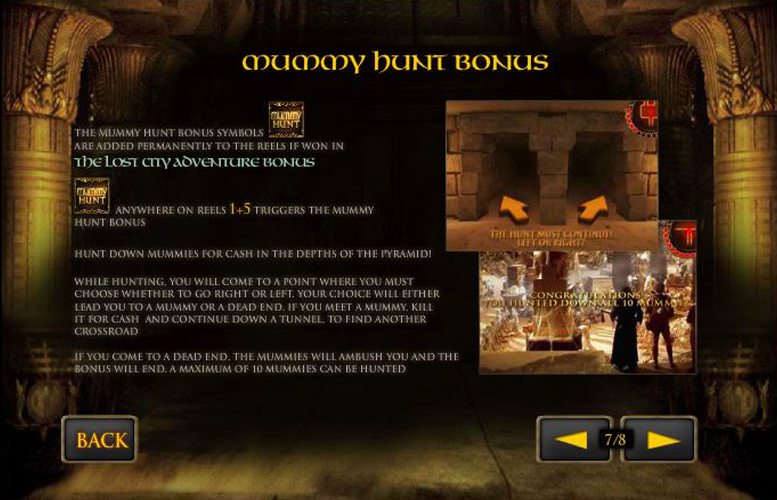 Players can hunt a maximum of ten Mummies. 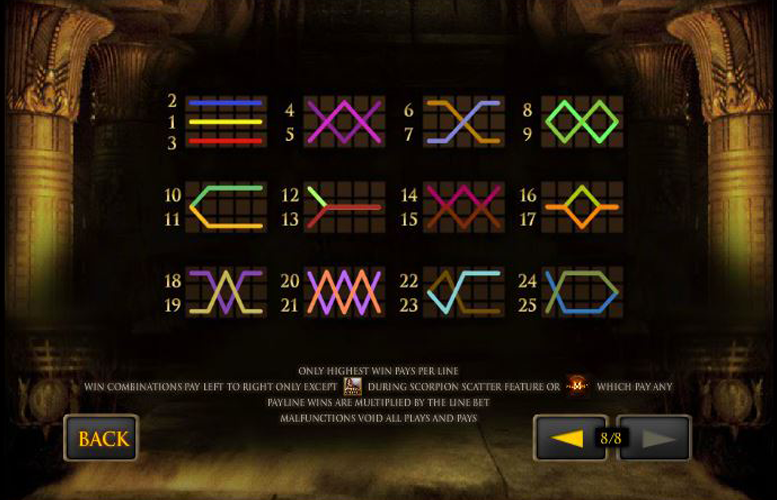 On The Mummy slot machine, players are only able to adjust the amount bet per win line. The number of lines is fixed at 25. Options range from the smallest bet of just 5p, to the largest bet of £1. This makes the lowest bet per spin possible on this machine £1.25, and the largest £25. These figures will likely please most players, although those who like to bet big will find them tragically small. Some machines allow players to wage up to £2,500 per spin, The Mummy manages just 1% of this. All told, The Mummy slot is fantastic. It looks, sounds, feels, and plays perfectly. There’s a wealth of different bonus features which keeps the action fresh and players engaged. Players who aren’t wishing to bet more than £25 per spin will be hard pressed to find a more enjoyable slot than this one. However, those who are fond of betting big, or perhaps a simpler slot experience might find the machine to be a let-down.